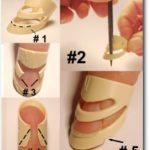 What to do when you got a broken nail?  Every classical guitarist probably faces that problem and the fingerpicker sooner or later as well. But however the solution, it was never to the full satisfaction of the guitarist. For the first time the aLaska Pik fingerpick, available in either plastic or brass, offers a real alternative. 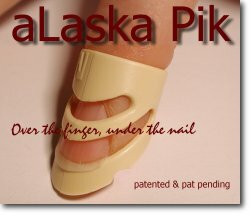 Placed “over the finger, under the nail,” the aLaska Pik in an amazingly simple way replaces the fingernail. 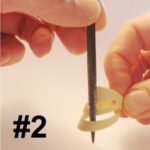 Only a minimum of your own nails is necessary to ensure a safe and secure fit. Before first use the pick needs to be custom fitted to the nail of the player. (please see instructions). 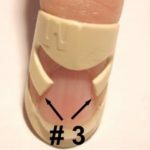 After this procedure the pick stays on your finger in such a safe way that you are able not only to pick but also to strum with it. Even Flamenco guitarists get their money’s worth. The picks are available in 4 (plastic) and 3 (brass) different sizes. 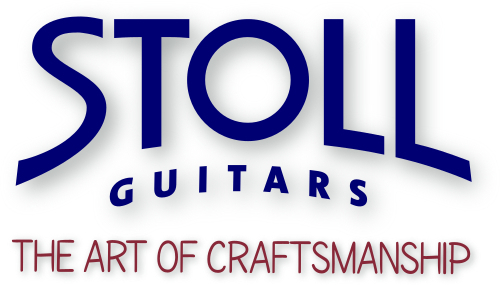 First the tight fit of the pick must be optimized. 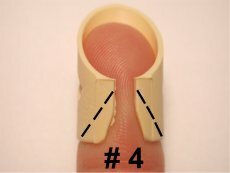 This can be achieved through filing down the pick at the inside of the picking surface to custom fit it accurately to the shape of the finger (see #1). 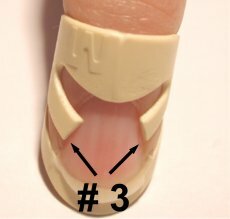 Lead the file as shown (see #2), to avoid the foreign body sensation under the nail as much as possible. 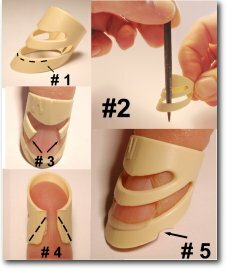 For the manicure the pick now is put firmly over the finger and under the nail. For this purpose also the edges of the fingernails, particularly the outside corners, should be filed smooth. Thus prepared, the pick can be shortened with a nailclipper and filed to the desired length. 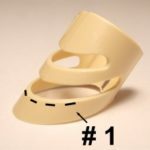 In order to make the pick more flexible, one can remove the pressure band totally or partly. 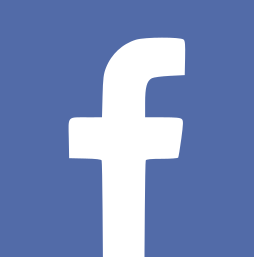 (see #3). 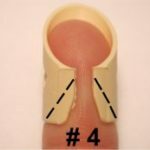 If the pick slips out from under the nail while bending the finger it can be generously chamfered at the bottom (#4). All sharp edges should be filed smooth. 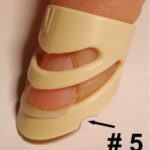 aLaska PikTM can also be used for lateral picking with the thumb, if one nicks the place marked with #5, so that the pick achieves the form of a fingernail.